Brief notes on its substance and its development. For decades I had been searching for a simple, robust 48vdc (batteries) to 230vac 50HZ Pure Sine Wave Inverter that will actually do and deliver the kW’s it says it can, and also hold a stable HZ frequency. 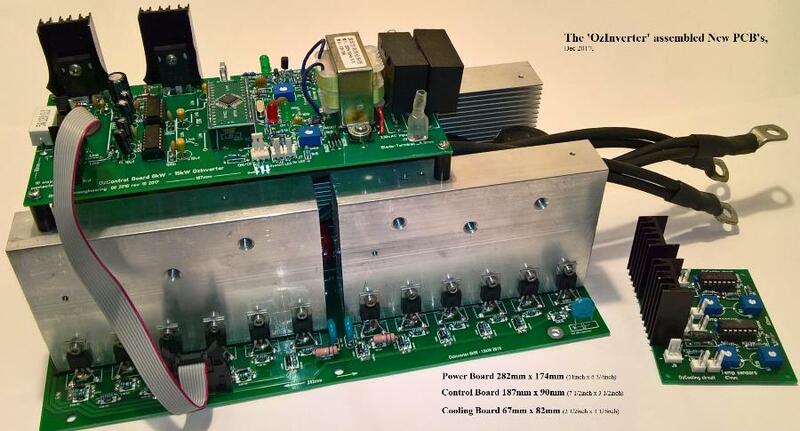 Oztules helped me to achieve my dream Inverter, and it runs beautifully. Most folk with normal homes that are Off Grid or want to be, need about 3 to 5kW of power around the house. Sometimes they may need 6kW for ½ hour or so, or infrequently up to 15kW , the OzInverter will do this, that’s if your batteries can take/handle it. 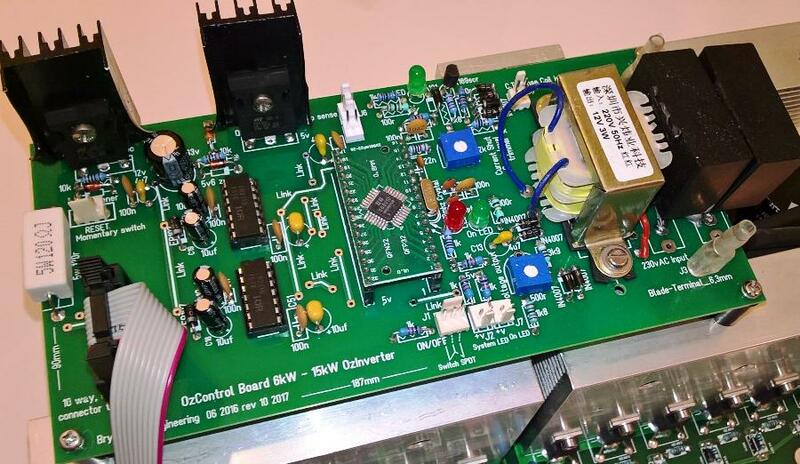 The above Photo of the inside, shows the Chinese PCB boards, they are actually okay, but QC issues, the required modifications and availaibitty problems has recently pushed us forward to create Our Own Power Board and OzControl Board and OzCooling board. AC Coupling, OzInverter Mini Grid. With the arrival of GTI’s, (Grid Tie Inverters) that uses the PV on the roof of houses, and subsequent lowering of prices, and the availability of second hand or old stock, we can now directly feed the AC output from the GTI’s into our OzInverter created mini AC grid. So we no longer need as many costly DC battery chargers/controllers. If you are not using the GTI’s output around the home, then the Excess 230vac AC will backfeed through the OzInverter and become DC and charge your batteries, which is what I do. Some sort of battery charging regime will be required. As your batteries fill and become full, the OzInverter raises the 230vac voltage slightly, and with most normal GTI’s this then goes outside their normal working parameters, and hence the GTI shuts down. In the book, I also talk about a fail safe protection for the batteries. 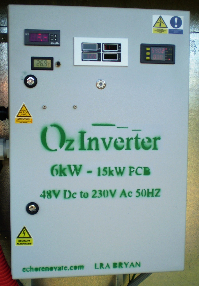 What can the OzInverter do?. The Toroid transformer is the key here, for a 6kW Inverter we are talking about 26kg to 30kg of laminated wound silicone iron core, with a centre hole say about 90 to 100mm diameter. This will then match with our New Power Board and its matching New OzControl board. No commercial available toroid will do, we stack cores, do the maths on the cross section mm/2, (real working figures), gives us a rough guide on the Secondary windings and Primary windings from the known ratio. (Its in the book page 18, 19, and 20). We wind the large toroid by hand, (photo example of the table set up is in the Book), as no commercial winding machine can get into our stacked cores. We mylar tape and epoxy each winding, this stops the buzzing and movement of the windings so eliminating early failure due to internal vibration and the consequent shorting out. We test each winding for correct turns etc, we wind a low count single primary core, about 50mm/2, better cooling abilities, we bench test it and test the secondary and amend the primary turn to get what we want. The New Power Board, the New No12 OzControl board and OzCooling board, SEE PHOTOS ABOVE, are designed for real harsh environments and manufactured with large tracks, large pads, to stop substrate separation and importantly all components are through hole type, so in the field repairs are relatively easy. Especially if you have insect/moisture infestation. We also put all component values on the boards silk screen, so its "painting by numbers", and therefore very easy to repair without dragging out paperwork to find out what goes where. We use the 8010 SMD chip, (the only SMD component) and run at 23.4KHz modulation frequency. We have several methods of soft starting the large toroid and this is a key issue. We have also all the normal things, like overtemp shut down and auto restart, etc and can be 50Hz or 60Hz. 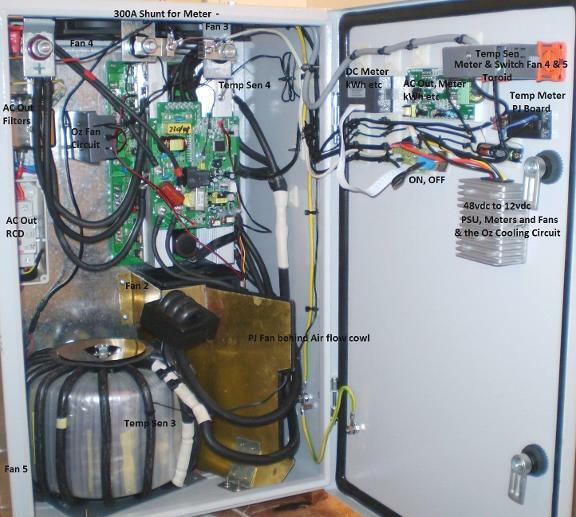 They will take 6kW and up to 15kw but cooling is the key here, again its in the book with the OzCooling circuit and Board. If you follow the book’s methods, you end up with a robust, simple, stonking big, serious Power Inverter, and all at a very reasonable Price, around $600.